Pain, Parties, Work by Elizabeth Winder is a compelling look at a young Sylvia Plath and the life-changing month that would lay the groundwork for her seminal novel, The Bell Jar. In May of 1953, a twenty-one-year-old Plath arrived in New York City, the guest editor of Mademoiselle’s annual College Issue. She lived at the Barbizon Hotel, attended the ballet, went to a Yankee game, and danced at the West Side Tennis Club. She was supposed to be having the time of her life. But what would follow was, in Plath’s words, twenty-six days of pain, parties, and work, that ultimately changed the course of her life. 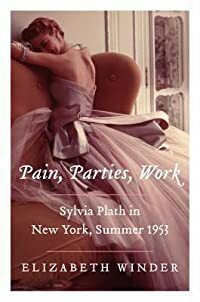 Thoughtful and illuminating, featuring line drawings and black-and-white photographs, Pain, Parties, Work: Sylvia Plath in New York, Summer 1953 offers well-researched insights as it introduces us to Sylvia Plath—before she became one of the greatest and most influential poets of the twentieth century.